Beautiful devil, Japanese anemone. - Welcome to The City of Desire. I hadn't even realized these started to bloom. The unopened flower buds look really cool. 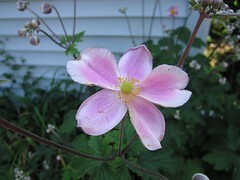 I have these fantasies about sneaking into people's yards and planting anemones and columbine there. You know, to beautify the world? I'm pretty sure I'd be violating some kind of agricultural law, though! We should keep them all to ourselves, I guess.